Viburnums bloom in green, shades of light pink, and white in the last part of April through early May. Viburnums vary in their height, spread, and style of flower. While most flowers are unscented, those that are fragrant are wonderfully so. The leaves are opposite, simple, and entire, toothed or lobed; cool temperate species aredeciduous, while most of the warm temperate species are evergreen. Some species are densely hairy on the shoots and leaves, with star-shaped hairs. 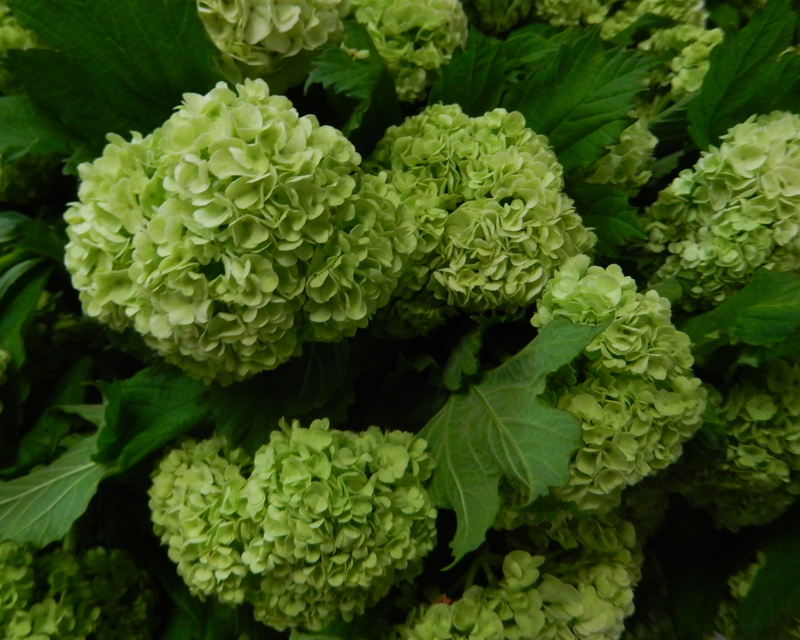 Viburnum opulus (Kalyna) is one of the traditional symbols of Ukraine. Mentions of the bush can be found throughout the Ukrainian folklore such as songs, picturesque art, Ukrainian embroidery, and others. Chervona Kalyna was the anthem of theUkrainian Insurgent Army. Kalyna Country is an ecomuseum in Canada. Viburnum opulus is considered an allergy-safe pollen-producing plant by the American Academy of Allergy, Asthma and Immunology. The species name “opulus” is from the Latin “opulentus,” which means “splendid” or “sumptuous,” for the blooms’ appearance.